The color selection widget is, not surprisingly, a widget for interactive selection of colors. This composite widget lets the user select a color by manipulating RGB (Red, Green, Blue) and HSV (Hue, Saturation, Value) triples. This is done either by adjusting single values with sliders or entries, or by picking the desired color from a hue-saturation wheel/value bar. Optionally, the opacity of the color can also be set. The color selection widget currently emits only one signal, "color_changed", which is emitted whenever the current color in the widget changes, either when the user changes it or if it's set explicitly through the set_color() method. Lets have a look at what the color selection widget has to offer us. The widget comes in two flavors: gtk.ColorSelection and gtk.ColorSelectionDialog. You'll probably not be using this constructor directly. It creates an orphan ColorSelection widget which you'll have to parent yourself. The ColorSelection widget inherits from the VBox widget. where title is a string to be used in the titlebar of the dialog. 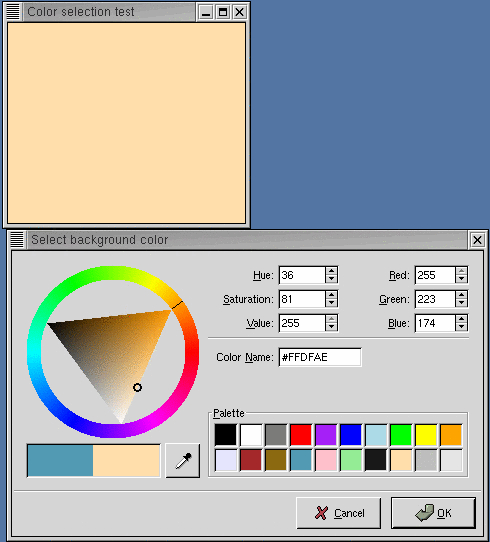 The ColorSelection widget has a number of methods that change its characteristics or provide access to the color selection. The color selection widget supports adjusting the opacity of a color (also known as the alpha channel). This is disabled by default. Calling this method with has_opacity set to TRUE enables opacity. Likewise, has_opacity set to FALSE will disable opacity. You can set the current color explicitly by calling the set_current_color() method with a gtk.gdk.Color. Setting the opacity (alpha channel) is done with the set_current_alpha() method. The alpha value should be between 0 (fully transparent) and 65636 (fully opaque). When you need to query the current color, typically when you've received a "color_changed" signal, you use these methods.